Celebrate a fun birthday with a toast to the awesome baseball season our Los Angeles Dodgers had this year! 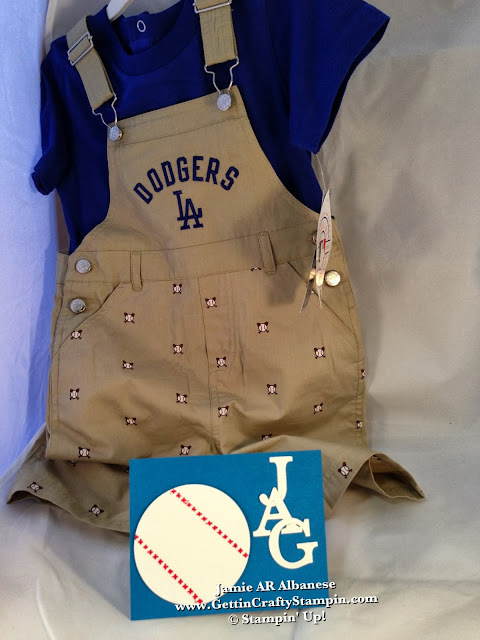 When little Jag turned 2, I just couldn't resist grabbing this mini Dodgers outfit and creating a card that matches! What do you think?!? Leave me a comment and let me know. Share this (and me) with your family and friends... Pin, Email, Facebook, Tweet, Google+ this and Follow Me on this avenues (YouTube, Instagram and LinkedIn, too!). Jag is the first born to a sports loving dad. When his dad went pro in basketball, I couldn't resist a nod to Jag's 1st birthday with a Basketball card. 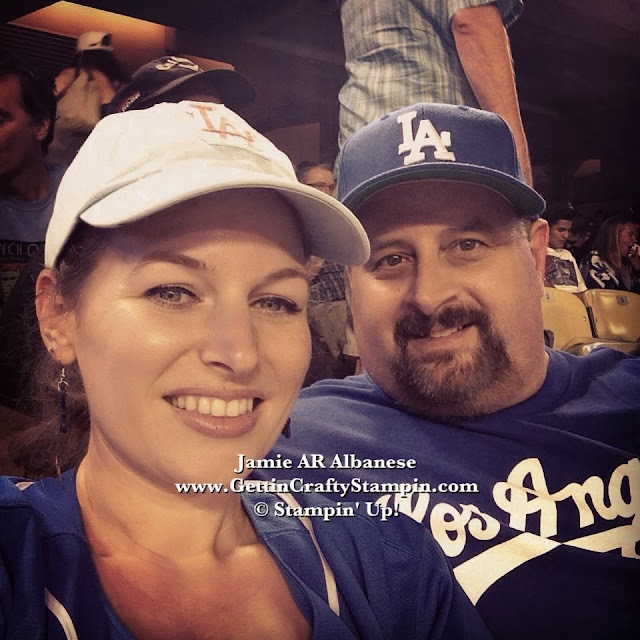 This year, we have all been vying tickets to and celebrating the Dodger's winning game streak this year! 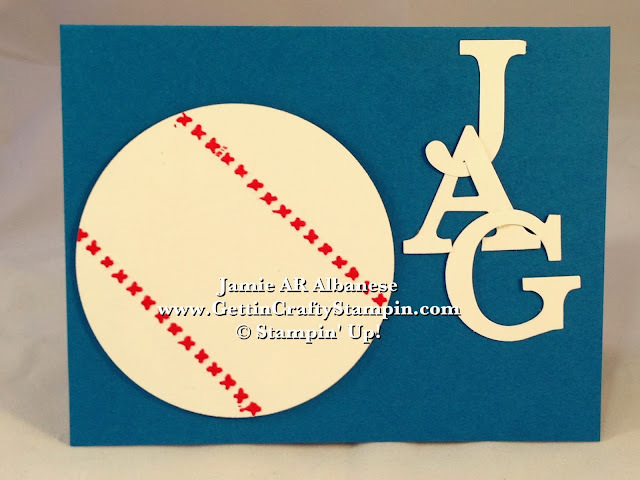 This ensemble inspired a fun card that plays on the LA Dodgers logo to Celebrate Jag! 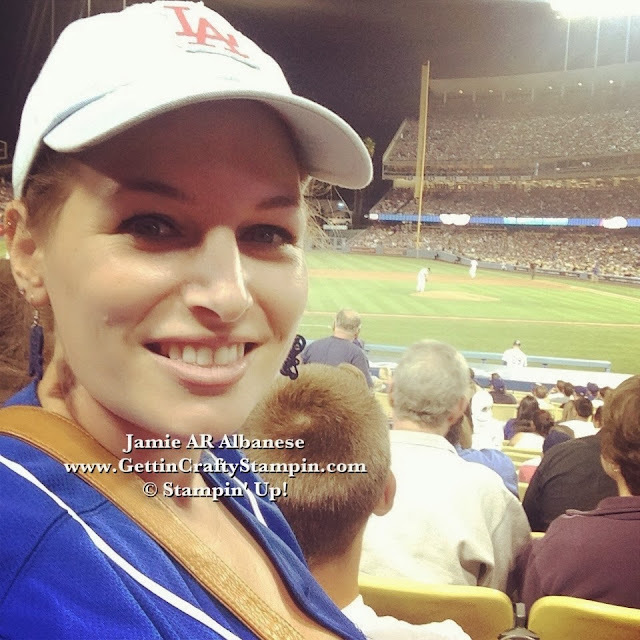 Dodger Blue was attained using our Pacific Point card stock (#111350). 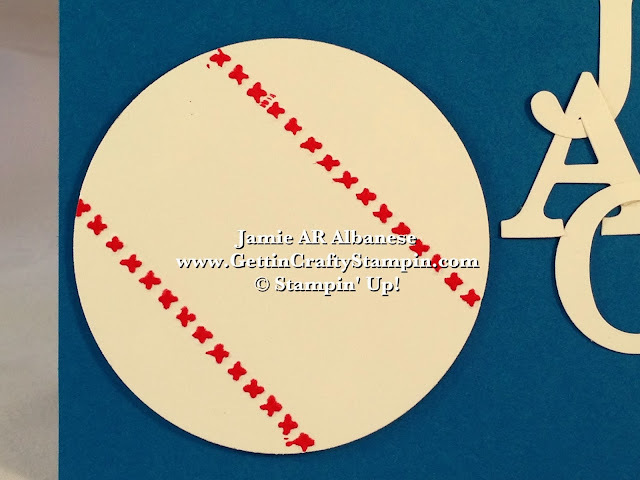 Create a fun baseball with the help of our Big Shot Die Cutting Machine* and our Circles Collection Framelits* (#130911). 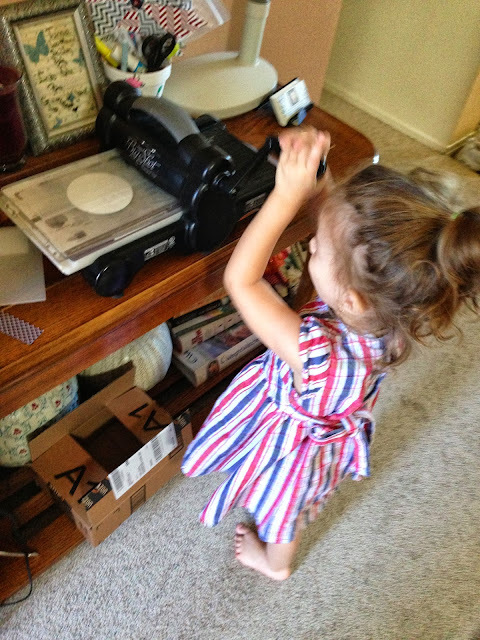 The Big Shot Magnetic Platform* holds the framelits right where you want it for precision placement and cutting! Using the Big Shot and creating 3D stitching (much like a baseball has) using our Needlepoint Border embossing folder (#129383) to create this fun textured accent. 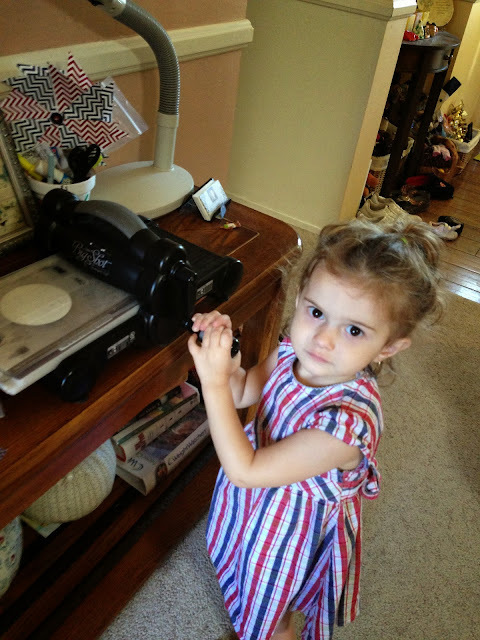 Highlighting the raised stitches with our Real Red Stampin' Write Marker (#100052) - easy peasy! 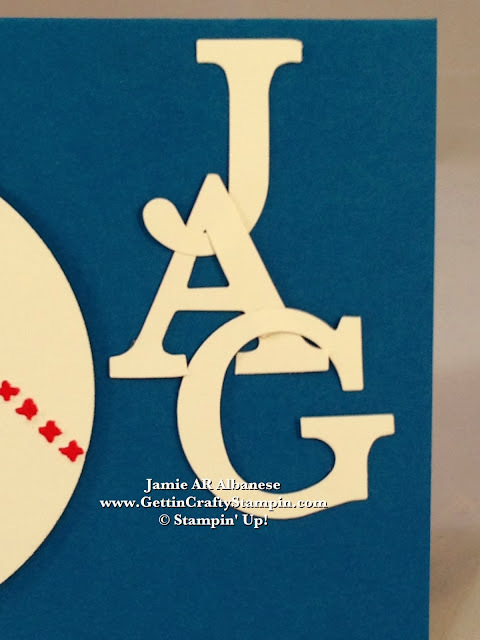 Using the Whisper White card stock here, as well, (#100730) and the Big Shot Die Cutting Machine* I created these fun letters. Our Typeset Alphabet Bigz* (#127553) die cuts these letters - allowing for easy personalization of any project! Fun look, Texture, the Baseball raised for dimension - using our Stampin' Dimensional Adhesive (#104430). 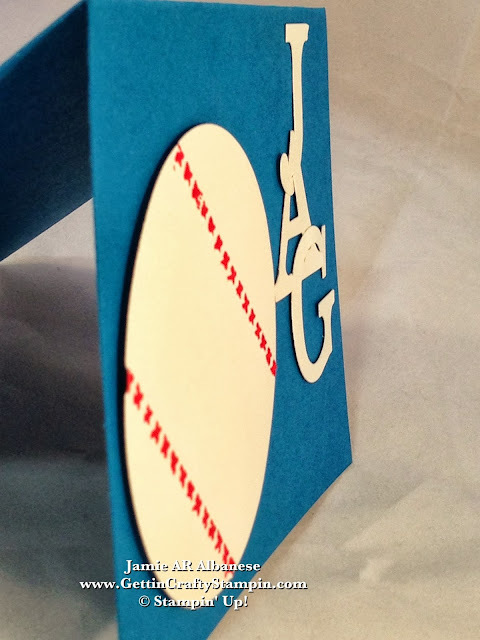 The raised texture and fun letter play on the logo... any sports fan would love to receive this card! OK Cheer with me... we scored Box Seats this past Saturday.. what fun!! With their famous Dodger Dogs, Garlic fries, my hubby, son and his pal.. we cheered on the home team with zeal! I'm so glad you joined the game today - ok, so maybe just me and my blog, lol. I try to post daily and hope to see you back often - bring your friends along to play! Come Play (in person or virtually) in my classes!! Bring home a Big Shot, Tons in Accessories and PDF Tutorials to OWN in my Big Shot Club! See how Hostesses Earn the Big Shot (it's accessories or what ever you chose) Free or 1/2 Off! Cheer Jag on with us! Every Sports loving fan will enjoy a card that gives props to their favorite team and sport!! Giving a Personalized card and gift is a great way to show you care. What team and sport would you celebrate?!? !